Andre W. is a loving husband, father, and grandfather. He is also a Veteran living with ALS. According to The ALS Association, heroes who have served in the military are approximately twice as likely to develop ALS as those who have not served. 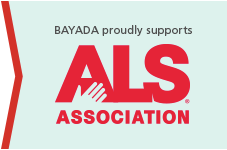 Therefore, ALS is considered a service-connected disease, regardless of whether the individual served during a time of war or peace or the era of service. Andre served during the Cold War, spending most of his time providing border patrol and security in Czechoslovakia. In 1983, he returned to New York and was in the reserves for three years, earning his license as a professional plumber. After working as a plumber for years, Andre noticed some weakness, aches, and pains in his limbs but attributed them to the demands of the job. However, in 2004, Andre tripped several times and noticed that his legs and arms had gotten even weaker. He knew something was not right so he went to see a neurologist, who misdiagnosed him with motor neuron disease. In 2008, he met a Veteran who had ALS and discovered that ALS is considered a service-connected disease. Thinking that he may also have this disease, Andre began researching the disease and found that many of his symptoms aligned with it. 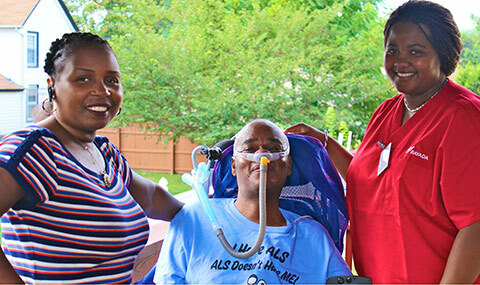 Concerned, he met with a neurologist in New York who confirmed his suspicion: Andre had ALS. Determined to keep his life as normal as possible, Andre continued to work until 2009 when his symptoms greatly worsened, forcing him to give up his career as a plumber after 34 years. As Andre’s legs became weaker, he began needing more help to move about their home and, especially, when he was outside. 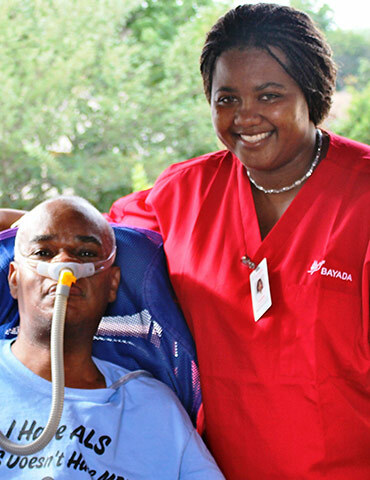 In 2012, when Andre began using a wheelchair full time, he and his wife, Antoinette, called BAYADA because they knew they needed more help to assist Andre and keep him safe at home. At first, Andre only needed assistance with activities of daily living. 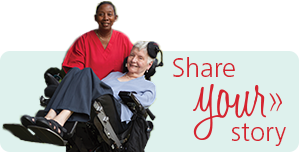 His BAYADA Home Health Aides help him with feedings, showering, dressing, moving around his home, and attending activities and gatherings outside of his home. Because Andre is a Veteran, the Veteran’s Administration (VA) provided many of the home modifications that he needs to safely maneuver in his home, as well as a power wheelchair. 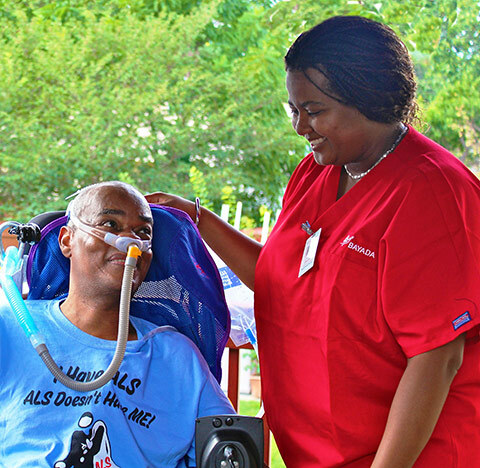 ALS has not affected Andre’s ability to communicate verbally, so he is able to form a close relationship with his caregivers. However, it takes a lot of trust, patience, chemistry, and communication with his caregivers to share his needs with them and he is grateful that he can do so. Andre is a huge advocate for technology and any assistive devices that can help people with ALS manage their disease and improve their quality of life. Andre shares that Claudine is always willing to learn about the various pieces of equipment or technology that is available to him because of the VA, and helps him practice until he has mastered them. When Andre was first diagnosed, he was told he only had a few years to live. Naturally, he was devastated, thinking that he would never be able to meet his grandchildren. However, he has fought this battle for many more years than expected and has six grandchildren from his three children!